Crataegus coccinea flowers. Scharlachdorn. eggert-baumschulen.den (Accessed 2/2018). 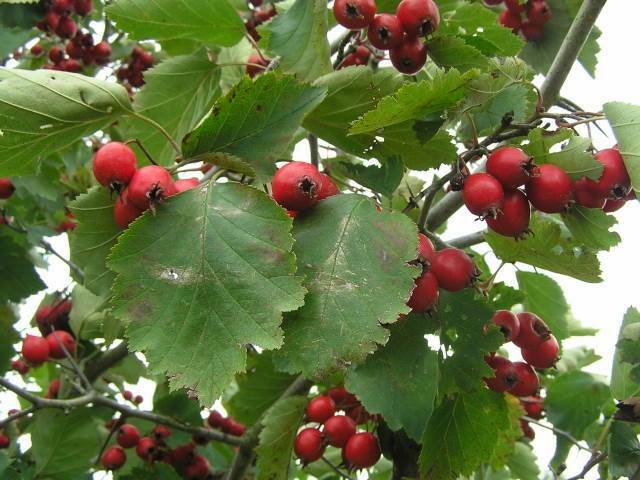 Crataegus coccinea is a small tree or shrub to 10 m tall, branches thorny. Leaves alternate, egg-shaped to almost round, to 7 cm long, 6 cm wide, with 3-5 pairs shallow lobes, margins toothed, base broad, blunt, young leaves rough-hairy above. Flowers white, to 2 cm wide, sepals toothed, glandular, anthers pink or red, ca 10, in branched clusters, May. Crataegus coccinea fruit. Scharlachdorn. eggert-baumschulen.de (Accessed 2/2018). Fruit fleshy, bright red, somewhat oblong, to 1 cm thick, old calyx broad, flesh thin, seeds 3-5, Sept. Frequency in NYC: Very infrequent, probably cultivated or escaped. Habitat: Woods and stream banks. Apparently prefers limestone . rich soil. Notes: Hybrid hawthorns occur frequently. Historically, hawthorn species were most likely confined to ephemeral open areas on flood plains and disturbed sites. With extensive land clearing by Europeans, separated species colonized abandoned fields and hybridized extensively, creating difficult taxonomic problems, now compounded by cultivation of exotic hawthorns. 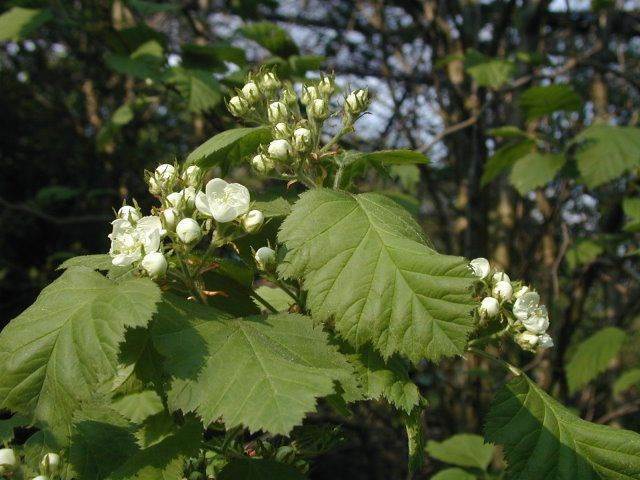 Insects that attack hawthorn include the aphids Aphis pomi and Eriosoma crataegi that damage leaves and twigs. The larvae of Anthonomus nebulosus (Curculionidae, snout beetles), feed on the anthers of unopened flowers. The larvae of the fruit fly Rhagoletis pomonella (Tephritidae), feeds on mature fruits (Borror and White 1970). The major fungal pathogens of hawthorn are cedar-apple rust, Gymnosporangium juniperi-virginianae, hawthorn-cedar rust, G. globosum, G. confusum Quince rust (Basidiomycotina); symptoms include bright orange spots on leaves and often fruit with orange, coarsely “hairy-looking outgrowths, and Entomosporum leaf spot, caused by the conidial state of Diplocarpon mespili (Fabraea maculata, Ascomycotina) (symptoms include necrotic spots on leaves and fruit).